427 yds Par 4 SI 3 - At stroke index 3 this is a tough starting hole from the yellow tee...but find the fairway and par is possible. A long second shot is required for most but a large green awaits the accurate hitter. Par here may feel like a birdie! 496 yds Par 5 SI 9 - The 2nd Hole is a dogleg right. 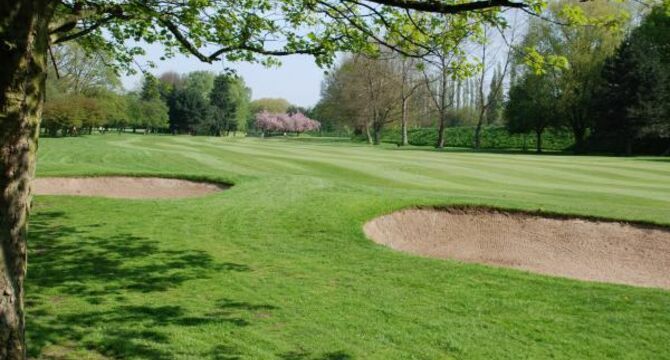 A good drive down the left hand side avoiding the fairway bunkers leaves the longer hitter a choice. Lay up or go for the green in two. A lay up to the dog leg is the smart play. 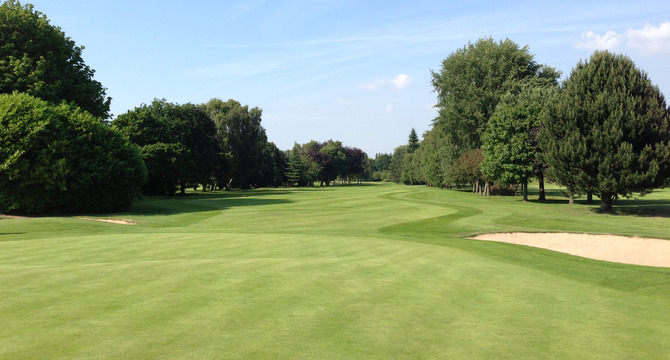 383 yds Par 4 SI 7 - This slight dogleg left with fairway bunkers left and right again requires an accurate drive. A long well guarded green awaits you. Par 3 138yds SI 17 - Don't let this lovely short hole deceive you. Judge any wind here with care. 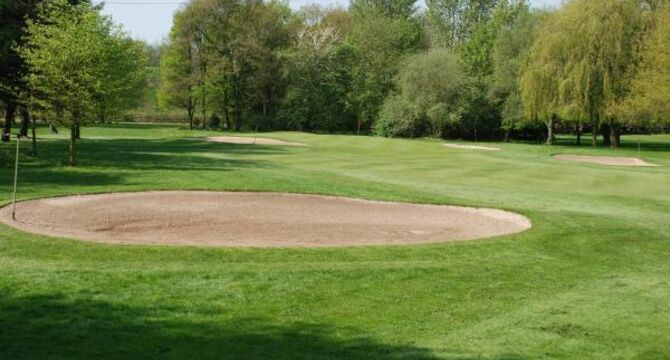 The green is surrounded by bunkers so a smooth swing is required. Be happy with Par. 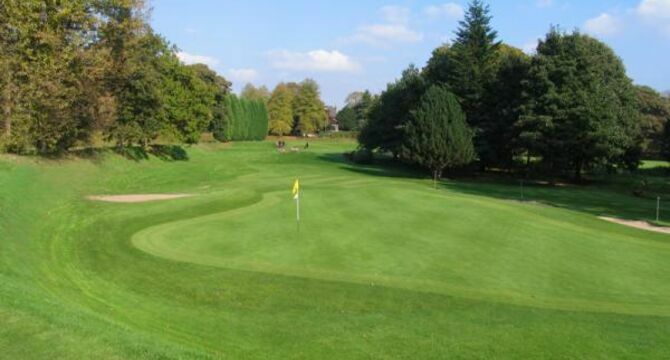 Par 4 331yds SI 11 - The 5th hole is not long but presents the golfer with a choice. Go with a driver and take off some of the severe dogleg right. Or play safe to leave a shot of about 140 yds to a narrow green that slopes downhill from back to front. Par 5 570yds SI 1 - At 570 yds off the yellow tee it's still the longest hole on the course. 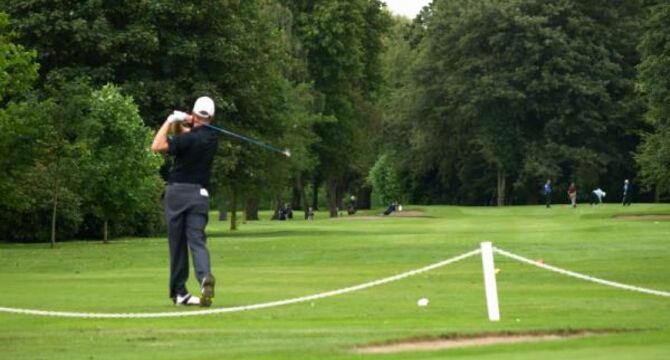 A good drive is vital if you want a par or better. 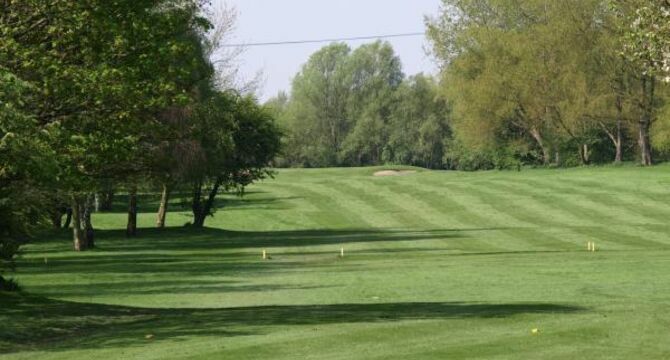 The left-hand ditch awaits the over-cautious golfer trying to avoid the willows and the River Mersey. Commit here. 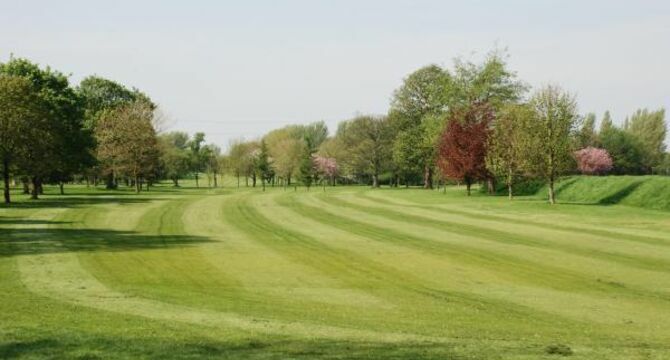 Par 4 381yds SI 5 - A good drive down the right hand side will open the green up for you. 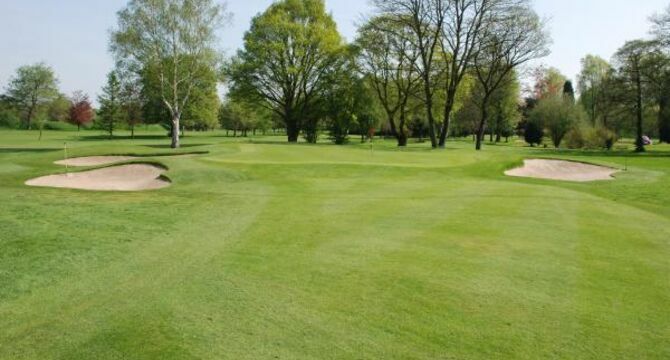 Although one of the flattest greens on the course, beware as the breaks are subtle. Par 3 152yds SI 15 - Hit the green here and you could be rewarded. Hit the green in the wrong place and you'll be happy with two putts. A tough Par 3 but depending on pin placement a good birdie chance. Centre of the green is always good here. Par 4 338yds SI 13 - Driving back towards the Clubhouse a wide fairway tempts you. Check the pin position here as a large two tier green awaits. As does the Halfway House!! Par 4 342yds SI 8 - Not a particularly long hole but always a tough tee shot. Aim left of centre to see all the green for your approach. Another big green so one more club maybe required to get close. Par 4 316yds SI 14 - Do not go right off the tee here. The pylon in the distance is the perfect line to leave you a shortish iron into a narrow and undulating green. Par 3 195yds SI 6 - The longest par 3 on the course requires accuracy. 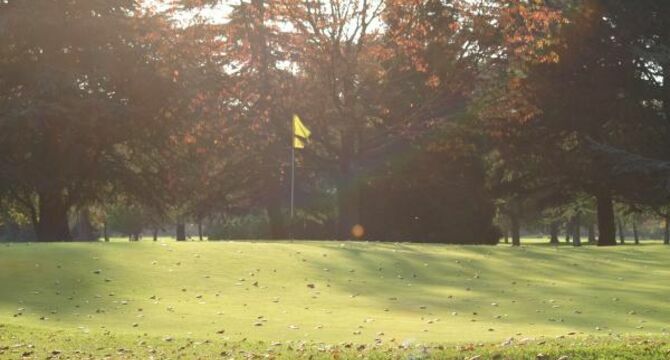 If using a wood or rescue club, landing just short should see you roll onto the green. Only the brave take dead aim here. Par 5 484yds SI 2 - A long uphill par 5 that requires two good shots to leave a short yet tricky third. A raised green requires a bit more club...not too much though as too long could spell disaster. Beware of the Out of Bounds along the right-hand tree line. Par 4 321yds SI 16 - Short par 4 but with a small and steeply sloped green. Accuracy is definitely the key here. A good approach below the hole offers a good birdie opportunity. 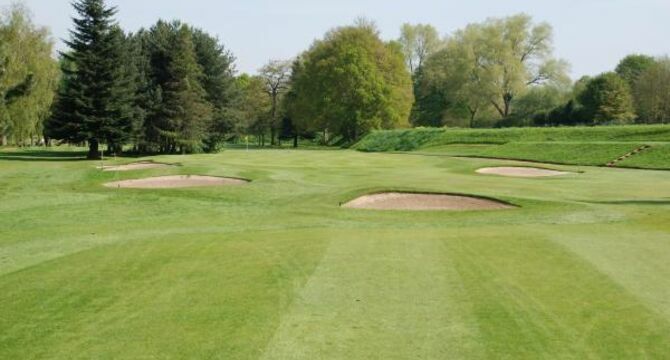 Par 3 161yds SI 10 - The final par 3 offers another large green but trouble lurks with a lateral water hazard down the right and well placed bunkers. 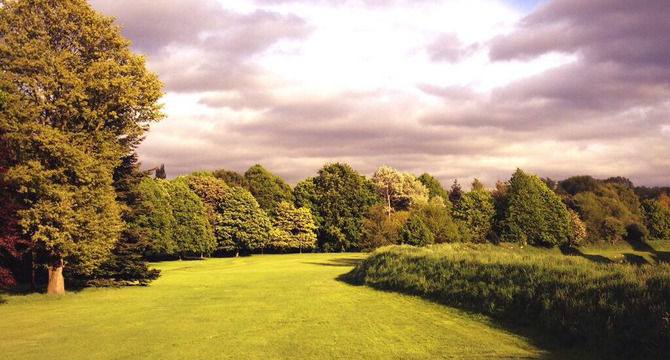 Par 5 496yds SI 12 - Aim right of centre avoiding the bunker to open up the slight dogleg left further up the fairway. 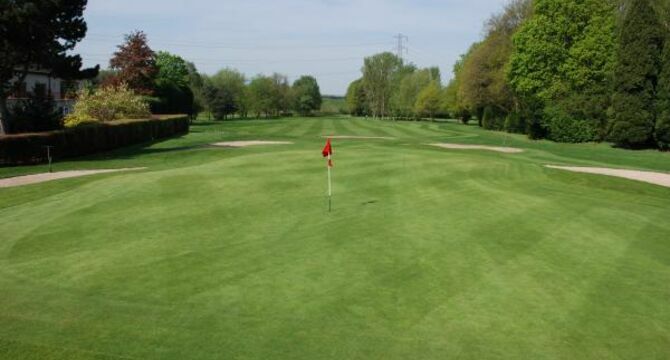 A good second favouring the right slightly, will leave you a good look at the pin. 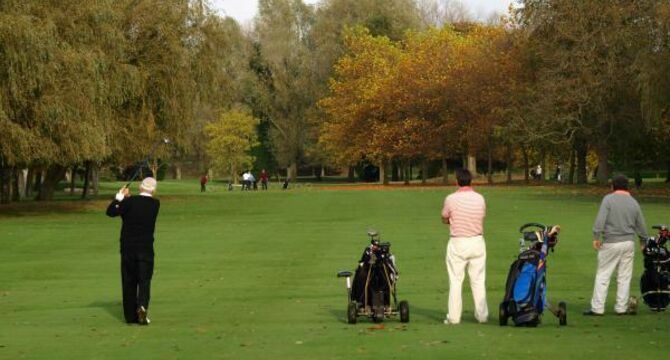 Don't be fooled by the long, narrow green! Par 4 354yds SI 4 - Trees down the right. Out of Bounds down the left. It's wider than it looks down there so stay calm. Two good shots here and par is possible but beware of some deadly borrows on the green! Fly the course! 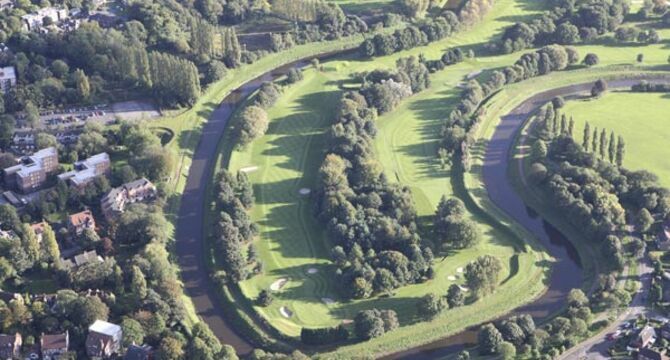 Let aerialGolfCaddy take you on a bird's eye view of all 18 holes! Take off from here. 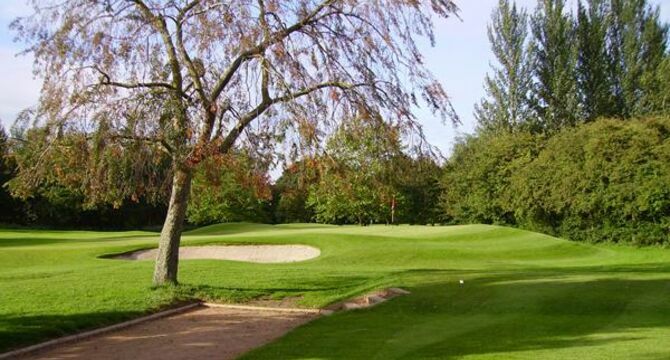 Northenden is an 18 hole, 6460 yard parkland course which was 100 years old in 2013. 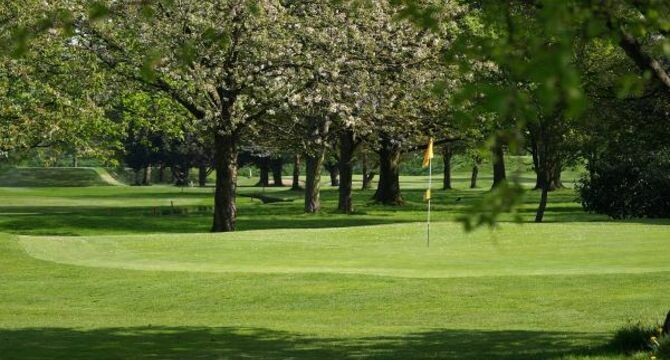 Many improvements have taken place over the years, most notably in 2005 when the Club invested almost £600,000 to reconstruct all 18 greens to USGA standards. Extensive new drainage was installed across the fairways and the result is a course that plays all 12 months of the year. 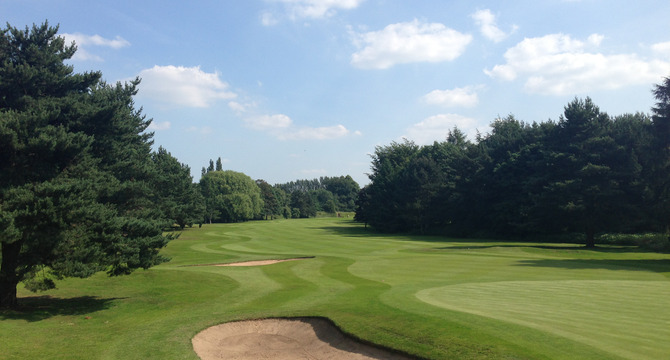 "I joined in 2009 and so far I have not once played to a temporary green"
This investment, together with the hard work of an excellent greens staff under Head Green Keeper Robert Cleisham, has made the course at Northenden one of the finest in the South Manchester area. 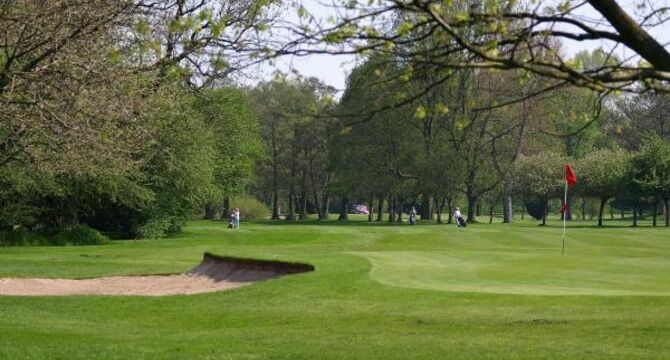 In May 2012, Northenden hosted the Cheshire County Match Play Championship and the County were so impressed that they awarded the Club a Cheshire County match against Durham in May 2013. 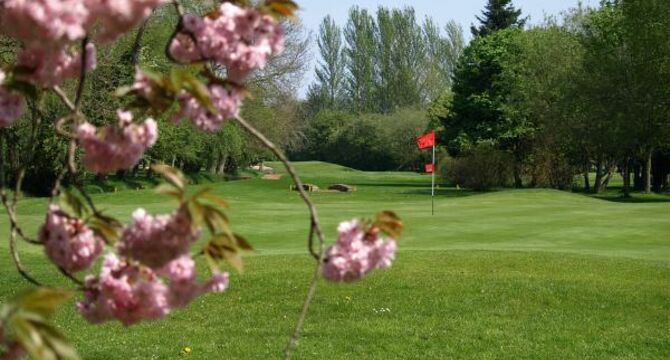 Set in the Mersey Valley and ringed by the River Mersey, Northenden provides a tricky but enjoyable test of golf in tranquil and picturesque surroundings. Visitors are afforded a very warm welcome and we are sure you will enjoy our course.